A good writing curriculum has been the bane of my homeschool existence. It doesn’t help that my child with autism, like many children with autism, has difficulty getting his thoughts on paper. I have paid other people literally hundreds of dollars to teach him how to write essays and paragraphs. We’ve done copywork and dictation ala Charlotte Mason but he is still a very weak writer. Enter The Power in Your Hands by Sharon Watson. Holy smokes, I about cried when I looked through this book. It is exactly what I have been looking for in a writing class for Logan. The daily lessons are short and sweet. Hard enough to make him think and work at it but short enough not to exasperate him. It tells him most of what he needs to do without a lot of assistance from me which is a big plus in my book. As a high school junior in the fall, I want him to do most of his work independently. There are 21 writing assignments in the teacher’s guide along with tips and hints on how to grade the student’s work. This is way more than you need in an academic year. If I was teaching Madison who loves to write then I would pare this down. Logan needs all the practice he can get so he will most likely do them all. He is most excited about writing his testimony. This is hands down going to be our writing curriculum next year. I love that it helps teach him how to write an SAT essay too. I love this curriculum so much that I am buying Jump In, the middle school version for Madison and JoJo to use. You can get either curriculum at the Writing With Sharon website for under $60. Yes, you read that right. Under $60! I can’t believe that I have paid upwards of $250 for a writing class . If you have a reluctant writer or a child with special needs then this is the writing course you need for a great price. 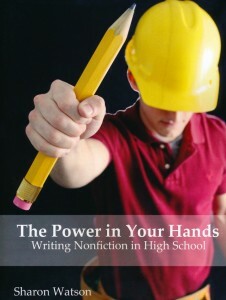 With The Power in Your Hands: Writing Nonfiction in High School, they’ll learn what they need to know for high school and will be prepared for college writing. First, they’ll write five different persuasive essays, including an SAT essay. Next, they’ll navigate a comparison-and-contrast essay, a biography, a literary analysis, a research paper with MLA documentation, and much, much more. In addition, students will master description and narration essays. Want to see what other reviewers have said about this program and the others in the set? Hop over to Homeschool Mosaics to see more ! Hi, Penny! Thanks so much for your enthusiastic review of The Power in Your Hands! I love it that this course is going to replace much more expensive writing courses for your son, and I would LOVE to read his testimony when he finishes with that chapter! Would you send it to me? Thanks Sharon! I absolutely will be happy to share it! I’m excited!